Lewis R. Gordon, an Afro-Jewish philosopher, political thinker, educator, and musician, features the book in his blog and writes a beautiful tribute to ancestors who worked as domestics. 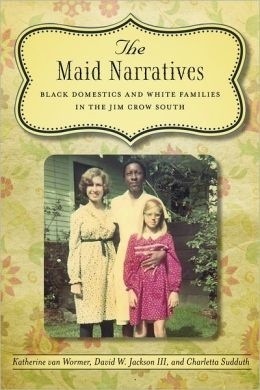 “The Maid Narratives tells a story with which many of us are familiar and one that continues to be misrepresented in so many ways, as the movie 2011 movie The Help (which I found unbearable) attests. Annie Lee took care of my 3-generational family from my pre-adolescence until after I had graduated from college. She was the person there when my grandmother and then my great-aunt died, and the person my aunt tried to talk with about her unhappiness. Her kind, loving presence did much to make up for my critical mother and stern grandmother. I had enough sense to value her highly and to keep up with her over the following years. Aware that her years of service to my family did not result in any retirement income, I sent her a check every month, and saw her several times a year, when my travels made this possible. I was the only white face at her 90th year birthday party, feeling both pleased that her family had invited me, but also pained that none of the other families that she had cared for so lovingly were there. I have had to ask myself if I would have had any of the grace and kindness she showed if I had been in her shoes. I think my knowing that I would not has made me into a better person. You are currently reading The Maid Narratives at JUST LIKE FAMILY.